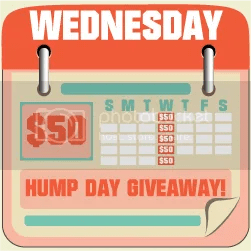 Together with other 25 wonderful bloggers, HUMP DAY $50 GIVEAWAY is now live! This week, we will be doing Facebook Page Likes! Are you ready? Also, please don’t forget to type your Facebook profile name that you used to follow on the Extra Info part when you fill up the I Did It portion. Each participant can only have a total of 27 entries. Thank you very much and good luck. By joining this giveaway, you agree to the Terms and Conditions on the bottom of the form. Contest is open from November 2, 12:01am EST to 11:59pm EST (November 2, 12:01pm Philippine time to November 3, 11:59am Philippine time).